A counter-drone laser in use by the Army was on display here this week, giving Marines a glimpse at how they might melt drones soon. The Compact Laser Weapon System, or CLWS, is already part of the Army’s Mobile Expeditionary High Energy Laser program. It’s deployed on Stryker vehicle in Europe and has been used in field experiments. The Boeing creation is a 5 kilowatt laser that can be used in a range of methods, including counter-drone, counter-sniper, breaching obstacles, setting of unexploded ordnance, denying enemy landing zones and to defend ports or airfields. Soldiers in Europe now have Stryker-mounted lasers to shoot down drones. The lasers were tested in recent years at an annual fires event at Fort Sill, Oklahoma. Ron Dauk, program manager, Laser & Electro-Optical Systems, spoke with Marine Corps Times about the system for Boeing. They have developed 2-, 5-, and 10 kilowatt versions. The first 2 kilowatt version was tested at the Army’s annual Maneuver Fires Integrated Experiment in 2016. The next year the brought the 5 kilowatt now in use. This coming year will be a 10 kilowatt version. The laser can be mounted atop a vehicle, such as it was on the Joint Light Tactical Vehicle at the Oshkosh Defense booth. Or it can be put on a tripod and hooked to a generator to knock down threats at a medium-sized Forward Operating Base or at the perimeter of a larger installation. 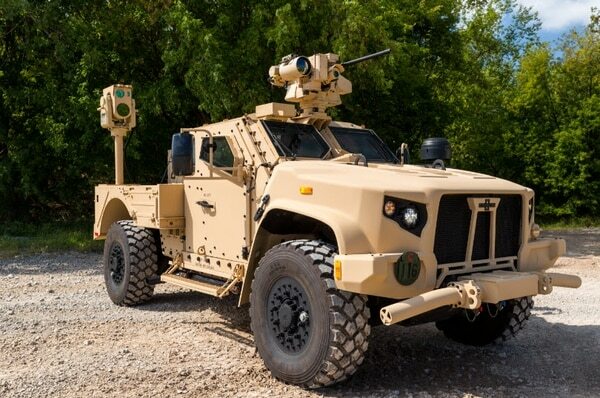 The JLTV configuration showcased at the Modern Day Marine military expo in Quantico, Virginia, was the first time they’d put those two items together publicly, Dauk said. Though they’re doubling the power with the next version, that’s likely the right range for now, he said. At that power level, the CLWS has a “deep magazine” and can strike down 10 or more targets in a matter of minutes, depending on the size of the configuration, such as a smaller drone swarm. The power comes from the vehicle or generator, so there’s no need to reload. “It’s able to operate as long as there’s gas in the tank,” he said. Boeing does have larger projects in the works. The Army wants a 100 kilowatt laser for more demanding projectiles such as mortars, artillery and missiles.